Close to 700 conferees from 65 countries convened in Havana, Cuba from January 28-31, for peace and “world balance.” This, the fourth such conference, was dedicated to honoring the ideals of Cuban national hero José Martí who died in 1895 at the age of 42 fighting for independence from colonial Spain. The event was organized by the José Martí Project of International Solidarity, which is sponsored by UNESCO. The wide-ranging conference addressed the “most pressing issues that have an impact on humanity” from global warming, to feminism, to cyber democracy, to sustainability. Well known personalities from all over the world included Spanish intellectual Ignacio Ramonet, Brazilian liberation theologian Frei Betto, historian of Havana Eusebio Leal, and a representative of the Vatican. Aleida Guevara, daughter of Che, spoke during the panel on solidarity along with Puerto Rican fighter for independence Oscar López Rivera. 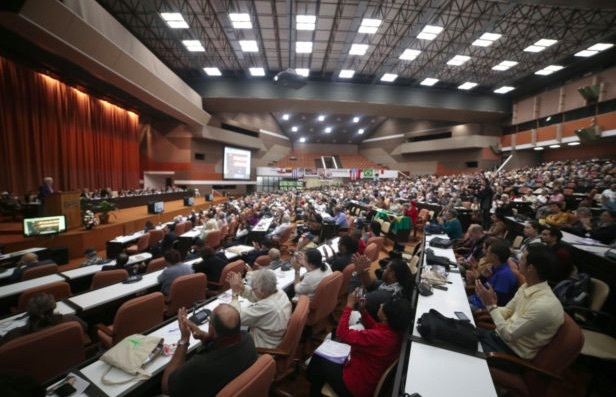 The first plenary session was attended by newly elected Cuban President Miguel Díaz-Canel and leading members of the Cuban government and Communist Party. They sat on the mainstage without fanfare or even significant security, other than a few unarmed men in guayabera shirts standing in the background; considerably less security, say, than the average US high school student must pass to get to class. Yuri Afonin of the Russian Federation Communist Party observed that the open colonialism of Martí’s time has been replaced by today’s neo-colonialism. With the collapse of the USSR/Eastern Europe, imperialism was given a green light. The planet has gone back to the 19th century as capitalism tries to impose its neoliberal hegemony. Adán Chávez Frias of the United Socialist Party of Venezuela (PSUV) and brother of Hugo Chávez spoke of the 2002 US-backed coup that lasted less than three days because the people rose up against it. Today, he reported, the civic-military union is stronger than in 2002 and will defend the process towards socialism. Rene González of the Cuban 5 and Vice President of the Martiano Program Office observed that many internationals, some of whom were at the conference, fought with the Sandinistas in Nicaragua against the US-backed dictator Anastasio Somoza and many more would now do the same if Venezuela must defend itself. Cuban Foreign Minister Bruno Rodríguez Parrilla closed the conference saying: “We inhabit a planet that is unequal as never before. We live in a world of enormous and growing imbalances, which cause great threats to international peace and security, to justice, and to the dignity of human beings.” He stressed that US imperialism is clinging to a unipolar order, which is historically discarded and unsustainable. The international conference adjourned, dedicated to an inclusive multi-polar world where, in the words of José Martí, patria es humanidad (homeland is humanity).